We found ourselves in a prickly suspension situation a little while back after striking a wash-out in the Flinders Ranges. One shock was blown, two required new bushes and the fourth had outer casing damage. Added to this, the rig’s factory rear leaf springs were riding flat-as-a-tack. Time for an upgrade. Talking with a few trusted sources in automotive engineering circles, the OzTec range of products looked like they’d fit the bill. 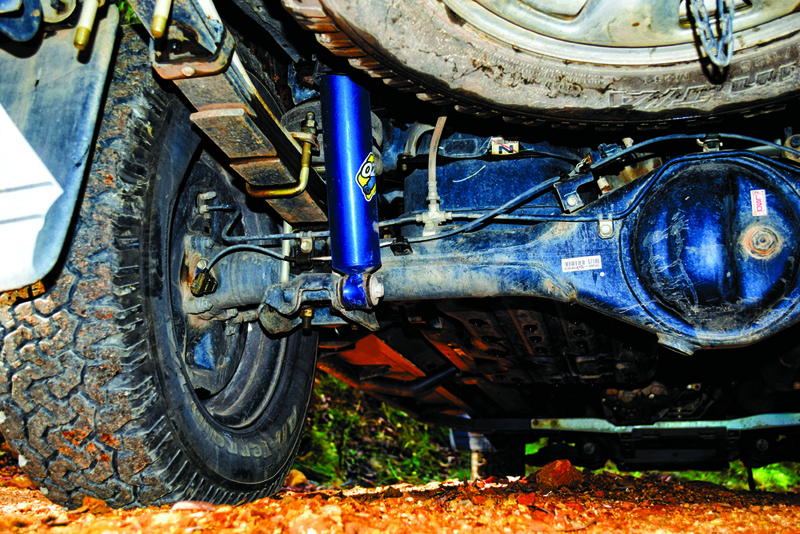 Their range includes complete suspension kits for many vehicles, and pre-assembled front shock and coil units for Hilux, Challenger, Colorado, BT-50, D-Max, MU-X, Navara, Pajero, Triton and Ranger. OzTec are able to research, develop, engineer and test their products here in Australia, physically road-testing across a range of road conditions prior to launch. After talking to the team about the way that we use our rig, OzTec’s ‘Outback’ series of shock absorbers promised to do the job. This product is made from a mix of Australian-made and imported components. Fortunately, the overseas imports come from reputed companies. Key features of the Outback include a 20mm OC Chrome Piston Rod with a 40mm OD Piston and Foot Valve. These shockies are made with 64mm OD bodies to carry as much oil as possible. This all helps to keep them nice and cool when the going gets rough. They also come with the option of Comfort or Cargo Valves to account for different user requirements. Because our Hilux has a set of after-market slave springs, installing shock absorbers of this size was a bit of a squeeze. The U-bolt and flange of the slave spring interfered with installation until it was moved 10mm (still within tolerances). This process added only 10 minutes to the installation process and wouldn’t be an issue for vehicles with factory or full-spring upgrades. However, after being extremely happy with the shockies we later decided on fitting the springs and being done with the slave springs. The spring upgrade needed to account for the fact that the Hilux already has a set of Airbag Man rear-spring helpers fitted. We were keen to retain these to reduce sway. The other issue was that our ’Lux spends quite a lot of time on sealed roads – not just off the beaten track with a heavy load – so we needed springs that were sufficiently adaptable. OzTec has several spring options to cater to users’ differing vehicle set-ups and load carrying requirements. We selected the mid-range spring options for their versatility – rather than the more robust set-ups which are better suited to rigs that are constantly loaded. Since fitting the OzTecs to the Hilux, the ride has clearly improved. With a full load, the vehicle sits steadily and handles well on both sealed and unsealed surfaces. Sway has been noticeably reduced and only the rig’s engine notices the difference when a load is attached to the tow ball. Notably, every time we’ve stopped the vehicle to check, we’ve been able to hold the Outback shockies with a bare hand. This is important. After all, the prime thing a shock absorber does is to transfer kinetic energy to heat energy and disperse it.